We offer a variety of automation services suited to seamlessly integrate technology into your home or office. Call or to send us an email to schedule your FREE consultation today! Start out automating your home theater or media room and expand to control lights, thermostats, shades and more. Through the use of advanced wireless technologies most automation can now be done without running a single wire. The days of overly priced, overly complicated automation systems are over. 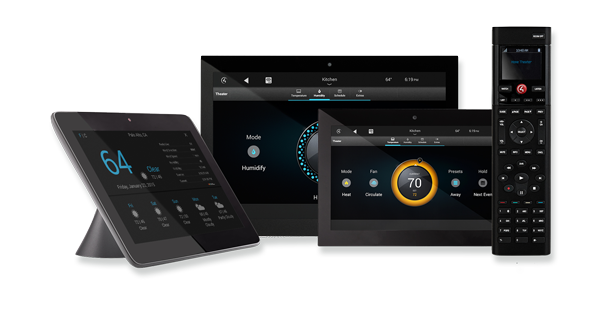 Talk to your DSCMI home control system designer and start simplifying your home today. Simplify your entertainment experience with one remote that does it all—and then some—at a remarkable price. In today’s home, electronics are becoming increasingly sophisticated. Even simple devices like DVD players now require a connection to the internet. As technology progresses (and it is happening fast), every device in our home will be connected. From washers and dryers to refrigerators and coffee makers. Our home networks will soon be similar in size to that of a small business. If you already have a modern audio video or automation system installed, chances are your home network is already sizable. Managing and maintaining these sophisticated networks is critical to insuring maximum reliability. Now with the use of sophisticated monitoring tools DSCMI can isolate and resolve network issues quickly and effectively, many times before you are even aware anything is wrong. And the best part is, in most cases, we wont have to send a service technician to your home to disrupt your day. Be confident that your systems will work when you need them, every time. Access control technology ensures the security of your home while providing easy access for approved visitors. If you have an automation system in your home you can take it a step further and set commands to respond when you open the door. Imagine – lights go on, music begins and temperature rises automatically as you enter your home. Talk to your systems designer about the security and convenience features of access control system. You can be notified with a text when your doorbell or gate rings, and choose to who can come in. In today’s modern home, network infrastructure is as important as the electrical and plumbing infrastructure. From simple commercial grade Wi-Fi systems to hardwired networks with QoS and hardware level security. Implementation of hardwired and wireless systems that just work. Once you have experienced the joy of listening to music seamlessly throughout your home, you will wonder how you ever lived without it. Whole house audio is a luxury that has become extremely popular because of its convenience and affordability. In an existing home or a new construction, DSCMI can design a system that enables each family member to listen to their favorite music in any or every room of your home. With whole house audio you can choose between multiple sources (AM, FM, XM, CD, MP3, iPod, Rhapsody, Pandora, internet radio, etc.) to play Sinatra in the living room, reggae by the pool, children’s music in the playroom, and French music in the kitchen. Comfort, security, elegance, convenience, and energy savings are just a few of the reasons that homeowners are embracing lighting control. 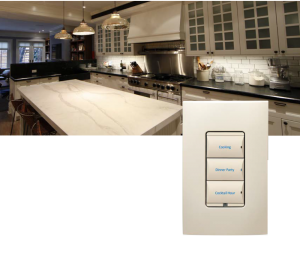 DSCMI can design a system for any budget, replacing traditional light switches with elegant keypads, touch screens and remote controls that enable you to program on-off timing, activate lighting with motion sensors, set dimming requirements, monitor your energy conservation and more. You’ll even be able to create lighting ambiance for specific moods such as entertaining, relaxing, reading or romance. Select the scene with the single touch of a button to create the ambiance you desire. Protect your furniture and floors from harmful UV rays, save on heating and cooling, and increase privacy with motorized shades, drapes and blinds. DSCMI installs programmable shades that extend or retract by time of day, sun sensors, or on demand through remote control or touch screen panels. Contact DSCMI to discuss the design options that fit into your decor and your lifestyle. We carry Lutron, Performance and Qmotion shades and blinds. Leaving your home empty or allowing others in your home while you are away can be unsettling. With discreetly placed video cameras and an internet connection, you can now see what is happening in your home at all times.Peace of mind is seeing your babysitter caring for your child, knowing who is at the door before you open it, watching the contractor as he works only in the room you’ve requested, and knowing that an elderly relative is safe in their home. Contact DSCMI today to learn more about this exciting and truly valuable technology that can protect your family and your home. confirm that an elderly relative is safe in their home.